I wanted to do some free motion quilting in large sweeping arcs over the main composition of the quilt. Here I've marked some general guides. 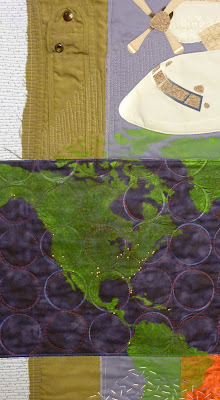 I used a tiny brush to paint over some of the white edges that were peeking out from the pre-quilted map section. Tedious, but I think it was worthwhile. I hate squaring up and measuring and remeasuring quilts. Sometimes I use this laser level to try to get a good 90 degree angle at the corner. Then I added a fused binding. Ug. I hated this dark blue, so I ripped it off. And replaced it with this light blue. You can see a piece of parchment paper sitting under the quilt in the shot above. I lay the pre-fused 1 inch binding over the edge of the quilt and let the other half rest on the parchment, then press. Then I flip the quilt over, fold the binding to the back and press the back side. I sew a straight stitch over this binding 1/8 of an inch from the edge of the quilt to secure everything. Here you can see I added some red embroidery floss over the binding in the red section at the top. I love this effect. Then cleaning with a lint brush in prep for photography. Ta da! It's called Orion Odyssey. Landing sites in North and South America. One last detail with a pocket from one of Jeff's old flight suits. Thanks so much for all your enthusiasm, support, suggestions and wonderful comments. Documenting the process of creating this quilt was almost as instructive for me as creating the quilt itself. Clean up the huge mess in the studio. 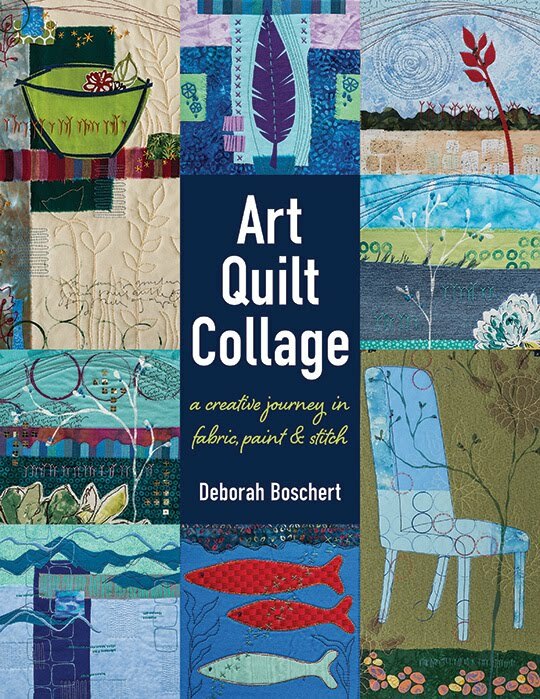 Deborah, I have enjoyed following your process. Your final result is certainly worth all your work! How fun it was to watch the whole process. The final version looks great! Thanks for sharing. Thank you so much for sharing your process, frustrations, and end result. It is fabulous. I hope you are delighted with it as well. Have a great weekend. I really enjoyed seeing your progress from start to finish. Thanks for sharing your photos and thoughts during the project. Congratulations - it's perfect! I liked it before you cut it up and remade it but I really love it now. 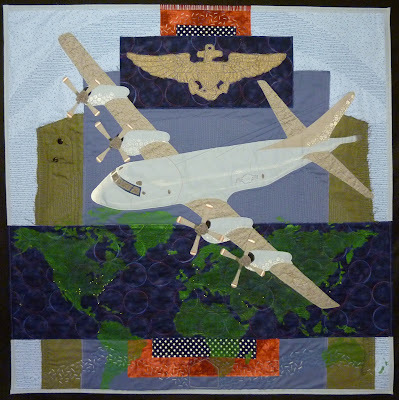 I just love that you incorporated part of your husband's flight suit in this piece and I love the gold beads (think I already mentioned that in an earlier comment)that mark the places he has been. Have you shown the finished piece to your husband yet? I hope you have gotten a great deal of satisfaction from this process and are pleased with your final "product." I just think it really turned out great. One more quick comment. Did you put a label on this quilt (on the back)? I would like to see that as well if you did. I enjoy the documentation as well as the actual piece. From one Navy wife to another, it's absolutely fabulous! Yay!! You did a great job working through this and I loved how you shared the process. Yeah! I love the touches of red. It's been very interesting to see you work through the design. This piece is Fabulous, Deborah! Really good work. I really liked the first design a lot but now that I see the finished product it's really fabulous. Thanks for letting us peak into your creative and thinking process! 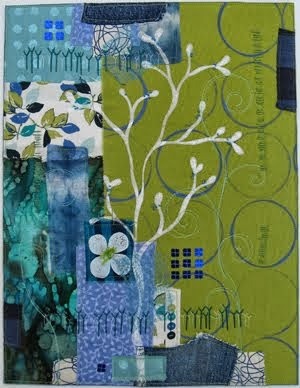 I have enjoyed following your process on this quilt. It was really interesting to see how it evolved from something very pictorial and quite different from what you usually do, and through the slicing and dicing( "oh, no what is she doing?") into something which is just SO right and so recognisably yours. It went from being great to fabulous! Thanks for sharing the process of this quilt with us all. It was great fun --and the Orion Odyssey looks terrific! Love the flight suit. Congratulations, Deborah. Absolutely fabulous and inspiring. Many congratulations to you. This is awesome! So much thought and detail. Thank you for sharing your process along the journey. Fabulous, Deborah, and yes...the matching binding is SO much better! Can't wait to see you in a couple weeks in Houston!!!!! Did you know that the background, the two sides made of the flight suit pockets, with the base and the top rectangle of the wings is in the shape of a traditional airplane hanger? The light blue behind just reminds me of the cavernous space that is the inside of a hanger. Really wonderful job all around.